LoadLogic takes height and weight snapshots of every load and calls the appropriate wrap pattern from among 9 preprogrammed, customized settings. Ensures that the optimal amount of stretch film is applied in order to produce efficiently and effectively wrapped pallets at an overall lower unit cost. LoadLogic helps you save money on materials by detecting the optimal amount of stretch wrap and wrap pattern for each individual pallet. LoadLogic is designed for manufacturers and warehouse distribution centers that routinely create pallets for shipping that vary in size, shape, and weight. The existing default setting is that every pallet gets wrapped as if it’s the heaviest and bulkiest load they can make. This results in wasted materials and inefficiencies in packaging. Our system helps save money on materials by detecting the necessary amount of stretch wrap and the optimal wrap pattern needed for each individual pallet, even when it’s loaded differently each time. 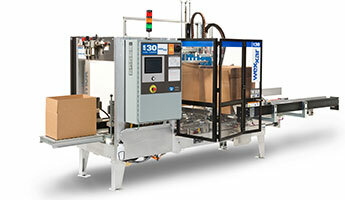 LoadLogic brings automated efficiency and optimization to the pallet wrapping operation. At Atlantic, we understand that not every pallet is created equal, particularly in high-paced, high-volume distribution centers. A short, heavy pallet of metal tools requires a different wrap setting than a tall, lightweight pallet of empty tool boxes. Up to now, the default scenario has been to set the wrap cycle so that the heaviest possible load will be protected. This default mode is designed to save time while ensuring that all products are protected. But it ends up causing significant overuse and overspending on stretch film. Atlantic’s LoadLogic system takes height and weight snapshots of every load entering the stretch wrapper. Based on these snapshots, a wrap pattern is automatically called from among 9 customized and pre-programmed settings, ensuring that the optimal amount of stretch film is applied. With LoadLogic, you’re still saving time while also saving on materials AND protecting all your products. LoadLogic helps you optimize your stretch wrapping operation simply and effectively. Because it’s an automated system, you are optimizing the time spent managing the operation. At the same time, you’re optimizing the amount of materials being used as well as the wrap pattern that will ensure the most effective load containment. OPTIMIZATION IS THE NAME OF THE GAME WHEN IT COMES TO YOUR STRETCH PACKAGING. LoadLogic is the ideal tool designed especially for distribution centers who are handling a variety of loads that seemingly defy a single optimized solution. Let LoadLogic automatically detect the dimensions of each load and and call up the optimal wrap pattern for it. Stop wasting time and materials – get LoadLogic! With our stretch wrap program at Atlantic, our goal is to help our customers get consistent results and sustainable costs savings. LoadLogic was born from this mentality of consistency, smart automation, and optimization to ultimately achieve excellent performance and cost savings. Contact Atlantic today to learn how LoadLogic can help your stretch wrapping operation.